Picture turning that page, it ended a quarter of the way down and the back is blank. Why? This is because you are starting a whole new chapter, perhaps a whole new “part” (you know those books that are split into multiple parts and then chapters). I am thinking about how to creatively graft this metaphor onto my situation. Let me take a different approach: how would I have begun this “chapter” of my life had I been writing it as a part of a book. Perhaps the last chapter would have ended with the hectic and stressful last minute packing and preparation before passing out on my parents’ couch for my last night in Colorado. We began driving. Well my sister began driving and as she found various ways to express her excitement, relief, anxiety, and all the other emotions that were bursting from her I strained to decipher my feelings. This was it right? This was when I was supposed to express my thoughts on this major transition. Up to this point I could say I was focused almost entirely on the preparations and therefore did not have time to think about superficial sentiments. Aw sweet rational, blank faced solace. But now that I was supposed to be flooded with all of those feelings that I had pushed aside yet I was still struggling to sort the internal disorder. I have not been one to cry for quite some time and I felt damn near guilty for that as I hugged my parents. I must admit that one pang I felt in my gut came from watching my mother wave to me and knowing that I would not see her for quite some time…odd, thank you Freud. I know of course that I will miss all three of the parents [Note: three parents? Refer to the end of Part 2 of this book] for varying reasons but leaving ‘mommy’ turned out to twist something inside and I would be lying if I said I was not surprised by this. We were on the highway anticipating what we knew would be the dullest and therefore the most straining part of the drive…Kansas. Kansas and its endless fields of corn and sunflowers where looking in the rearview mirror is no different than looking ahead, that is if there was any space to see out of the rearview mirror. 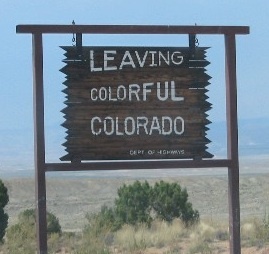 Farewell Colorful Colorado, you emblem of an independent century. I will miss your stunning sights, your schizophrenic weather, and your purple pretentious politics. As I make my transition to the Big Apple, a feat I will attempt to do without damaging these damned braces, I hope I will not go down in flames in a city that greatly overshadows the entire state that encompasses it. There are a few stops along the way and perhaps I will be able to sort out the chaos in my head by the time I get to Manhattan. Nah, probably not.